Raw Materials proudly presents a special photographic exhibition, EYJAFJALLAJOKULL, by internationally-renowned photojournalist Lucas Jackson. A former resident of Downtown Los Angeles and currently a staff photographer for Reuters out of New York City, Jackson has photographed a wide variety of assignments, ranging from the Academy Awards, to the war in Afghanistan. 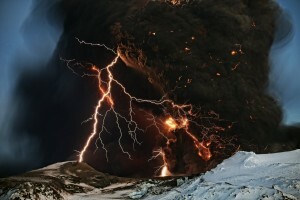 EYJAFJALLAJOKULL is a collection of stunning photographic images taken in April 2010, when Eyjafjallajokull, one of Iceland’s largest volcanoes, exploded and sent clouds of ash and volcanic matter soaring over European airspace, affecting millions of travelers around the world. It was the worst peacetime air travel disruption in history. Playing on the intersection between fire and ice, in EYJAFJALLAJOKULL, Jackson’s award-winning photographs of the ethereal Northern Lights and lightning engulfing the exploding volcano take their place alongside images of the devastation on the surrounding landscape, livestock, and farmers living in the shadow of the volcano. “I hope that my images convey even a fraction of the natural splendor that is almost commonplace here in Iceland. I have been humbled, and I do consider myself lucky, not because I took some pretty pictures, but because I got to be in the position to take them and was able to witness the event in the first person,” says Jackson. Lucas Jackson is a photojournalist for Reuters based in New York City. Jackson grew up on a cattle ranch in Quemado, NM before moving to Portland, Oregon where he received his Bachelor's degree in Mathematics. He committed himself full-time to photojournalism as a profession and moved to California, financing his equipment and costs by working as a commercial fisherman in Alaska. His path as a photojournalist has led him through small newspapers in southern California and a newspaper in Portland until finally landing in Los Angeles to freelance regularly for the Associated Press and Reuters. Jackson joined Reuters full time in October of 2006. Assignments covered for Reuters include a wide array of domestic and international assignments that range from the Academy Awards to the war in Afghanistan. Jackson has won international awards for his work from China Press Photographers Association, Pictures of the Year International, PDN Photo Annual, Prix de la Photographie, National Press Photographers Association Best of Photojournalism, and the New York Press Photographers Association.